We proudly service the nations most recognized brands. 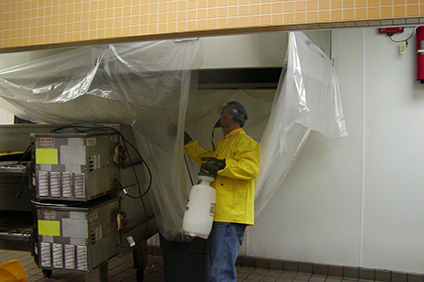 Each of these facilities preparing food are required to have their kitchen exhaust systems cleaned at a regular frequency by a certified hood cleaning company. Remember, the heart of any restaurant is the kitchen, and the core of the kitchen is the exhaust system. It needs to be in top performance and grease free for the kitchen staff environment (e.g airflow) food quality and customer safety. Restaurant managers want their hoods to be at peak performance but they have a lot on their plate! The best restaurants demand the best kitchen exhaust services and cleaning supplies. Easy Scheduling; Automatic alerts as to when your exhaust system needs to be inspected and serviced in the future. Inspection & Prompt Service; We perform a systematic inspection of your entire exhaust system from the roof-top to the cook-top. We offer a complete, fully validated, comprehensive report documenting our work. Invoicing Made Easy; Invoices can be mailed, emailed, or faxed depending on the restaurant owner’s preference. For national or regional accounts, we can provide consolidated billing and account management.